Doctor Recommended. In 20 states and more than 127+ hospitals. Wherever you see yourself and your new practice, chances are a CHS- affiliated hospital is nearby. And if you choose to practice with one, chances are you'll be glad you did. Approximately 20,000 physicians – employed and independent – serve on the medical staffs of more than 127+ CHS-affiliated hospitals in 20 states. e hospitals deliver a wide range of health services and function as vitally important members of their local communities. In 2015, e Joint Commission recognized 118 CHS-affiliated hospitals as Top Performers on Key Quality Measures.® And, an array of national quality recognitions and honors for affiliated hospitals includes accredited chest pain centers, accredited stroke centers, and Centers of Excellence for bariatric services. While we're literally "all over the map," we're focused on helping you find a place to build a successful practice. Affiliated hospitals have the flexibility to meet individual needs and the ability to offer competitive recruitment packages and start-up incentives, which may include medical education debt assistance and even residency stipends. Hundreds of physicians choose CHS-affiliated hospitals each year – for quality of care and quality of life. One may be right for you! For more information, visit: www.chsmedcareers.com. Email: docjobs@chs.net Call: 800-367-6813 CHS and Community Health Systems are tradenames/trademarks of CHSPSC, LLC, which provides management services to affiliates of Community Health Systems, Inc. Doctor Recommended. In 20 states and 100+ hospitals. Wherever you see yourself and your new practice, chances are a CHS-affiliated hospital is nearby. And if you chose to practice with one, chances are you'll be glad you did. Approximately 20,000 physicians – employed and independent – serve on the medical staffs of 100+ CHS-affiliated hospitals in 20 states. e hospitals deliver a wide range of health services and function as vitally important members of their local communities. CHS-affiliated hospitals boast an array of national quality recognitions and honors including accredited chest pain centers, accredited stroke centers, and Centers of Excellence for bariatric services. While we're literally "all over the map," we're focused on helping you find a place to build a successful practice. Affiliated hospitals have the flexibility to meet individual needs and the ability to offer competitive recruitment packages and start-up incentives, which may include medical education debt assistance and even residency stipends. 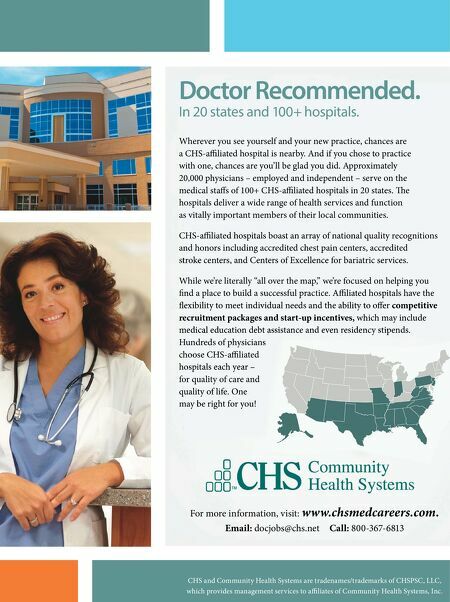 Hundreds of physicians choose CHS-affiliated hospitals each year – for quality of care and quality of life. One may be right for you!